This sign is trying to tell us something, but what exactly? “May” is a funny word. Very flexible. And vague. What it really means is “may or may not.” In other words, no information contained in it at all. That makes it useful when you’re trying to write a headline on a slippery story that doesn’t nail anything down. And apparently it’s useful for signs as well. Take this sign, for instance. It’s at the end of a new street that leads to the rear of the new Bonaventure Senior Living complex in North Albany, off the west end of Hickory Street. On the other side of the barricade, and about 6 feet straight down, is Blossom Lane, an unimproved track off Highway 20. So will this street be extended to Blossom Lane or beyond in the “near future”? Not a chance. It won’t be extended until and unless the property on the other side of the barricade is developed as some kind of subdivision. And at City Hall, they know of no plans by anyone to do so. 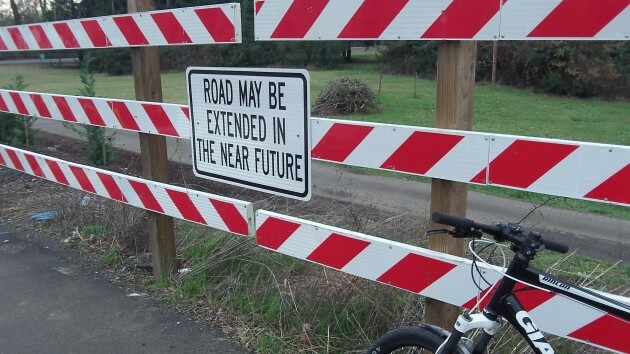 So why a sign that suggests something will happen soon when it probably won’t happen for a long time, if ever? Wow. On the one hand, the sign text is comedic and gives the impression of a lighthearted approach to city government. On the other hand, it comes across as noncommittal CYA that gives the impression of nonaccountability in our city government. Damned if they do and damed if they don’t? I reckon so. There is no question, and simply no doubt in my mind that this project may be completed at some point in the future or not.